My inbox today has the Healthy Kids Expo in Canada taking exhibitor apps, the Women’s Fund hosting the kickoff of Bioneers by the Bay (w/coolness king Van Jones of Green for All, and ever-awesome CNBC green journalist Simran Sethi) and yours truly of Shaping Youth headed to hear author Richard Louv, 2008 Audubon Medalist, as keynote for the Growing Greener School Grounds Conference! (walk-ins are welcome, last-minute greenies!) Last Child in the Woods is near and dear to me, for I’ve observed more than my fair share of media savvy kids with “nature-deficit disorder” in my own hands-on work with kids. The Green Schoolyard Alliance offers a wealth of ‘how-to’ knowledge and resources for ANY neighborhood to build community via local ecology, environmental stewardship, innovation for education, and creative ways to nurture kids’ academic mindfulness in health sciences. Wonder what kind of fun No Child Left INSIDE enrichment I’ll walk away with…I’m counting on all kinds of new ideas for ways to ‘get ‘em outdoors’ on both the wellness AND eco front. I plan on covering this event over on EcoChilds Play too, where I just wrote a piece on GreenRaising (school fundraising ideas that aren’t the usual wrap-n-read catalog offerings) Everything from seed packets to organic herb gardens…fair trade chocolate, pretty cool stuff for getting ‘how-tos’ for ‘greening your school’ early on! 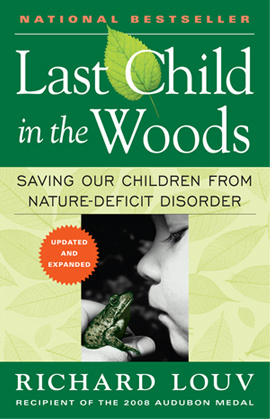 Here’s Richard Louv’s recent Today Show interview about ways to help your kids experience nature, and his local segment on KGO along with a smidge of his national print and broadcast coverage. If you’re unfamiliar with Cornell, here’s his site: ‘Sharing Nature with Children.’ Highly recommend both these gents for getting kids to engage with mother Earth for a greener future. As always Amy…class-act of a blog! Thanks for being there! Many schools use our environmental fundraiser to purchase things like seeds for their schools.